I have to just come out and say that the title is referencing “a little some’ some'” because the reference is pretty ambiguous. I’ll let someone else take the Shaun of the Dead reference. Why Shaun Shaun? Because it was a big week for two fellas named Shaun and now it’s time to get some. A Shaun named Hill won his start for the Vikings but we only care about him in 2QB leagues and even then I doubt we care because he might lose his starting job this week. Shaun Draughn, of all people, is somehow among the best FAAB acquisitions I could find for 12 team fantasy football leagues. It’s not the sexiest week one for acquisitions because week one didn’t reveal as many surprises as we expected. The good news is maybe we can avoid all “what a crazy Week 1” references. Please? (Aside: Chip Kelly is almost single handedly responsible for the 49ers offense not being a disaster against the Rams). Here’s your players to consider for week 2 FAAB (Free Agent Auction Bidding) waiver claims. All prices for $100 budgets so if your starting budget is not $100, view them as percentages. Tyrell Williams ($7) and Dontrelle Inman ($1). Sadly Keenan Allen is out for the season with a torn ACL. Tyrell Williams is the one I’d own for this situation although Travis Benjamin may be out there in some shallow leagues (see 10 team section below). This group will not be easy to predict from week to week. Target distribution for the first week was Benjamin – 8, Williams – 5 and Inman – 3. Benjamin’s targets were mostly short passes and I wouldn’t be surprised if Tyrell Williams is more valuable, it could be either one of them. Inman might be worthy of holding for a week or two just to see what happens. 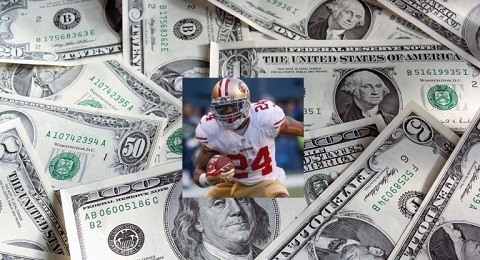 Shaun Draughn ($5) The backup running back in a fast paced Chip Kelly offense has some standalone value but he’d get a huge boost if Carlos Hyde were to go down. And Hyde has Injury concerns. Jesse James ($4) It will get better for Gary Barnidge owners with Josh McCown at QB. Coby Fleener owners, however, would be wise to ditch him immediately. Heath Miller was a solid fantasy option for years and Jesse James might just be Heath Miller with more upside. The 49ers Vance McDonald put up a better stat line but in my opinion Vance didn’t play enough snaps. Brandon LaFell ($4) – Worth considering because it might be LaFell, and not Tyler Boyd who has some value as the “other” receiver in the Bengals offense. Played in nearly all snaps and had one more target than Boyd. Possibly worth starting in leagues deeper than 12 while Eifert is out. In shallow leagues we have the weird conundrum of wanting to see more from him before we move him into starting lineups, which at the same time brings us closer to Eifert’s return which would negatively impact LaFell. Robert Woods ($1) Woods gets a bump regardless of whether Sammy Watkins misses games or is merely gimpy through them but he’s a low priority target if Watkins is going to tough it out. Clay and Salas are worth considering for deeper leagues or if Watkins gets shuts down. Cole Beasley ($1, more in PPR) Hard to tell how much of Beasley’s performance was dictated by coverage choices by the Giants. Probably a lot, but the out come (12 targets, 8 receptions) should not be ignored. Tevin Coleman ($12) Is somehow not owned in all 10-team leagues. That’s strange because his backfield homey, Devonta Freeman, was a second round pick. So the guy on the good end of a 55-45 carry split was worth a second round pick and the other guy was barely worth owning. Well, Devonta Freeman was at least expected to get the vast majority of the passing down work. But that didn’t happen either. Not saying it won’t. Eventually. Mohamed Sanu ($10) Sanu and Draughn were all I noticed as far as breakouts and Sanu is owned in many leagues (54% ESPN, 45% Yahoo). Like Draughn, Sanu is playing behind a good player with an injury history so he could get a major boost at some point this year. He’d be near WR2 territory if Julio Jones were to go down. Travis Benjamin ($4) Stock is up for former AFC North wide receivers in Week 1. Did Marvin Jones have a good game? Let me take this opportunity to briefly discuss replacement level. Travis Benjamin has a lower price for 10-team than his teammate Tyrell Williams does for 12 team and it’s sort of because I like Williams’ upside better. It’s also because Benjamin would be worth a slightly bigger FAAB bid if he were available in 12-team leagues. Because he’s more valuable in 12-team than 10-team because of replacement level. In theory. If all of these 10-team recommendations are owned in your league, simply consult the 12-team (standard size) league recommendations above. Jeremy Kerley ($2) There’s volume in the San Francisco 49ers offense if it’s decent and it’s looking decent through 1/32nd of the season. (LOL, but not really). That’s a wrap for the week 2 FAAB report aka World Wide FAAB. The price recommendations are low because I don’t particularly like any of these players. But do consider them. You can follow me on Twitter @RotoLance. In a 12 team, 2QB league I would add a starting QB any time one is available. @Packers: In 2 QB you almost have to roster a 3rd QB in preference to the others I’d think. Maybe if your two starting QBs are good enough you don’t have to. What about byes though? Damn I forgot to write about Hogan.. I’m sure he’s not owned everywhere.. I think I’d prefer Tyrell Williams to Hogan. Whose E. Rodgers? Richard Rodgers? @Packers: Oh, Eli Rogers, duh. I can be a bit slow with these things. Yeah I like all of those three but you have to go QB here I think. After week 1, can you pick who you see as your top 5 guys to grab in a .5PPR? @Rondo: Riddick, C. Coleman, T. Coleman, Ty Williams, J. White. Somewhat muddled but becomes even more muddled after those 5. Either Jordan Matthews or D moncrief? @Adam: Yes, either. I doubt he’ll accept. My RB’s are Spencer Ware, Jamaal Charles, Matt Forte, Ryan Matthews, and Derrick Henry. Which two would you start in week 2? I’m thinking Ware + either Forte or Matthews but I can’t decide which. @John: Forte has a near guaranteed nice yardage total although a TD might be hard to come by for him. I’d start him over R. Mathews, close call but I still trust Forte’s offense more over the Carson Wentz lead Eagles. Thanks for reading. Would you trade Kelvin Benjamin for Dez Bryant in a 14-team league with .25PPR? @Rondo: I’m not so sure. I have to think Benjamin’s large target number (12) was fortunate and typically he’ll “only” get 7-10. He still has Greg Olsen to compete with and the ball will be spread around. Dez is just so much uncertainty now. He’ll rebound, but to what level? I’ve never been a Dez fan but at the same time, like many others, I wasn’t high on Benjamin this season. Well, we’ve had to rethink our views on him. Take the Dez side if you feel like taking a risk. More upside there. @RotoLance: Dez has the name value but he doesn’t have the better team and I have no idea what Dak is right now. I’m going to hold and stay cautious. Eli Rogers, duh. Forgot to write about him. I’m not super high on him, Markus Wheaton’s return would take some value away. But, possibly the best guy to add this week actually. I needed to be taking better notes during the game last night. How much you suggest I toss out there to waiver for Theo? Thanks man dig the write up! @ryanoger: An actual FAAB question. Thanks. Theo Reddick, good player in 0.5 PPR, maybe $10? I think it’s ok if you let somebody else bid $25+ on him. But he’s certainly in the 10 team RB3/FLEX conversation most weeks. But there are a lot of other guys that also are, right? Maybe $15+ if you are RB needy. Cool thing about Yahoo! is they have projections for every week already and Riddick is right around 8.5-9.0 points per week. With that type of value he should figure into your RB2 discussion during bye weeks, well if those projections held true, but obviously it’s subject to change. Who should I lose to make the add or should I hold I like my depth as is but I also like the idea of rostering Theo, thanks again man! @ryanoger: Terrance West is a two down back on a mediocre (at best) offense/running game so his 0.5 PPR value is limited. He or Alfred Morris would definitely be the guy to drop but with Woodhead and Jarvis Landry on the bench you won’t be needing much Riddick. In fact I’d think Landry would start over Fitz but it is indeed a close call most weeks. I’d put in a fairly conservative, “price enforcing”, type bid on Riddick, dropping West. I’d rather keep Morris over West in case Zeke gets injured although ultimately they are both expendable. Good job with your bench. It’s actually frustrating for me to play in a shallow league. Next year encourage your league to play with an additional FLEX spot or two or perhaps 3 WR. There are plenty of players that score points in 0.5 PPR. That’s the direction I’ve gone with my home league. It’s QB RB RB WR WR OP(aka Super FLEX) FLEX FLEX D/ST. Thanks so much man! Dig the advice! I told Jay I think Zeke is going down and think Morris is gonna shine this year but we shall see on that. I def agree with you on adding a 3 WR or 2nd FLEX in our league, will throw that out there. I had Landry in at my flex until late last week and ended up throwing in Fitz cause Landry was going up against that Seattle def, it paid off. You’re def right about not really needed Theo week to week but I’ll take the RB depth where ever I can get it, thanks so much man! Keep the FAAB articles coming, dig them for sure! @ryanoger: I benched Landry as well last week on the non-PPR league I’m in. @ryanoger: don’t trust yahoo on projections, they still have forbath as the kicker somewhere and him projected to get points all year. Where is your head at with Beast Mode? I’ve currently got him on my bench but was thinking about a claim for Vereen. Should I stay put? Also would you claim Ebron or stick with Jesse J? @nightpandas: I don’t even know where to start on Marshawn. I don’t really like stashing long term players like that this early in the season. In 12 team or deeper it’s certainly easier than 10 team. Ebron and Jesse James are two players I like so you can’t go wrong either way. No Calvin Johnson in that Detroit offense is a good thing for Ebron. I don’t know.. Ebron I guess. That’s how I ranked them last week when I was asked by a commenter about James. Well that and Vance McDonald was in the middle of those two but he’d be last now. Ebron over Jesse James, if the waiver claim price is not too high. I’m not sure I’d give up a #1 priority for him, for instance. @nightpandas: Well, they are both good TEs to own in 12 team for sure. 0.5 PPR changes little to nothing I think, maybe an eve bigger edge for Ebron in PPR formats as opposed to Standard. That said, what would you do with these two? $3 Freeman, $6 forsett, $10 Stefon digs for $48 dez Bryant, $17 jeremy Langford, $6 Charles sims. What do you think on that trade? Basically I need to figure out what to do with these two bum.. What’s their trade value in a keeper leage? @Psh: I think you are definitely overreacting here. With Devonta, realize that no RB gets 100% of the carries. 75% is a very high amount considering that would equate to approximately 300 carry season depending on how much the team runs for. The Falcons had 420 rushes last year, some of them were probably not designed runs but QB scrambles, some of them were probably WR carries.. in any case the RBs still got nearly 400 carries. All Devonta Freeman needs to do to be a solid RB2 — not an RB4– is get about 60% of those. Which might be asking too much, but we don’t know yet. He’s not an RB4, in my opinion, more like an RB3 with upside, a chance for RB2. Trade him as such if you trade him. I think you are overreacting on Watkins too. Watkins has a bad game and we hear all this doom and gloom. If you believe the Bills, I think the jist of what they are saying is that it’s a pain management issue for Watkins. He can still be a low-end WR2. We can’t judge him off of one game. On the other hand if this pain slows him to the point where he’s a WR3-4 I’m not going to be shocked. Now if those are they’re keeper costs for 2017 as well, I think there’s no way you’ll get David Johnson. The other deal maybe a closer call. I just wouldn’t go into any trade valuing Freeman as a RB4. Think of him as a low end RB2, I think he can still easily be that. The Falcons run game was strong last year. 10 team half ppr league. Who would you drop for Victor Cruz, Tevin Coleman, and/or the Pats or Ravens D? @Larry G.: I’m not on the Victor Cruz bandwagon yet. If you are that’s fine, I just don’t see it. When Victor Cruz was good there was not much else there. Steve Smith who had like one good season I think was playing opposite him the year Cruz broke out. If I remember correctly. After that I don’t even remember who was playing opposite Cruz, competing for targets. Now there’s Beckham and Shepard. I wouldn’t drop Lockett yet. Definitely not for Cruz. He had a bad game, the Seahawks offense had a bad game, but eventually they have to get rolling, right? I agree the rest are droppable. I’d pick up Coleman first and one of those Defenses, either one will do. And if you want Cruz for D. Allen or Walford for instance I have no problem. Just hold on to Lockett unless there’s something much more enticing out there than those you named. any suggested bid for john brown? he was dropped for someone else on the waivers after week 1. i currently have b marshall, k benjamin, d parker, r matthews in a 12 team .5 ppr league with a $200 faab budget. @JBrownBid: Lovely. You have to love it when this happens, dropping a proven player for the next big thing, a player which may amount to the next nothing. I mean, maybe if it was Will Fuller. That’s someone I can maybe see dropping Brown for. But I digress. $40 maybe? He would be an upgrade over Rishard and DeVante. Earlier in the year I wrote that I’d rather own Rishard than Tajae and boy was I wrong. Not that Rishard is just a piece of junk to be tossed in the garbage, but I’d rather own Ty Williams, Eli Rogers, Brandon LaFell, Chris Hogan. And certainly I’d rather own John Brown than all of those fellows. And depending on how many WRs you can start he may find his way into your lineups quite a bit. Look at it this way. We sort of know what John Brown is. Will we see a bigger WR breakout this year? What I mean is, will any of the remaining waiver wire guys in your league be better than John Brown? A John Brown against the field sort of thing. And also, even if one of them were better than Brown, which is possible, because it’s him against the field… are you confident in your ability to identify that one guy among several potential breakouts? Uhh so yeah, spend what you think it will take to get him. I will say we have to be a little wary of the slow start for him, he didn’t play a lot of snaps last week, umm maybe, I’m not completely sure of that. But that might have been just a week 1 deal as he was recovering from an injury and didn’t have as many practice reps.